If you are looking for a food steamer, you will find many different food steamer options available in the marketplace. The options range from multi-compartment steamer machines, multi-tiered steamer pots, simple stand inserts, collapsible steamers and steamer baskets. Steamers can be bought from nearly any place, from sources like Asian supermarkets, online commerce stores, kitchen ware stores, local grocery or hardware store and superstores. So you want to buy a steamer and start steam cooking your food. But how do you choose one? Personally, I don’t think a good and useful food steamer needs to be costly or complicated. Your choice of a food steamer will primarily depend on your budget, available kitchen space, desired steamer shape and material (e.g., plastic, silicone, stainless steel). In this article, I will introduce three simple but versatile types for you to consider if you plan to purchase one, as well as a method to make your own if you don’t want to buy an additional piece of equipment for your kitchen! Here is an example of a medium-sized stainless steel multi-tiered steamer pot. It comes with 2 levels that can be added on to make a tower of 3 levels for putting foods in to steam. Such steamer pots come in different dimensions and some have more removable layers to create taller towers. This steamer was bought in an Asian supermarket store that sold kitchenware. Benefits? This steamer pot comes in very useful for steaming big items (like a whole kabocha squash, spaghetti squash or acorn squash), as well as multiple dishes at once. It is easy to clean and you can decide how many layers you want to add on. Most of the time, I find I don’t need to add on an additional layer, as 2 layers work well enough for our family of four. 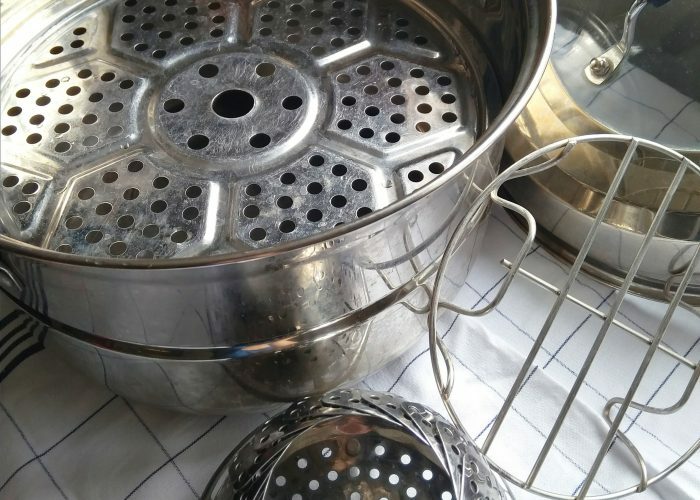 I am able to place a shallow bowl of rice on the very bottom of the steamer (using a simple stand insert – read below) and then place the flat perforated circular insert on top, before placing a couple of dishes on this to steam all together. I find this is a quick way to steam a lot of items at once, so that all reach the same temperature at about the same time. A steamer pot is also versatile in that it doubles as a large regular cooking pot that you can use for boiling noodles in or as a stir-fry or soup pot. Cons? It is large so you need to have storage space in your kitchen cupboards or cabinets! This in my opinion, is the prettiest of the lot. The stainless steel steamer opens up like a flower, and is designed to be collapsible so that it can be tucked away out of sight in the kitchen when not in use. Benefits? This is an extremely versatile and inexpensive little contraption. It opens up to fit any sized pot, and you can steam smaller food items on it or one large item (e.g., half an kabocha squash or acorn squash) as long as the pot is big enough. You can also decide if you want to use a plate or bowl over the collapsible steamer or steam food directly on the steamer itself. Even if the pot is very large, the collapsible steamer will open out completely till it is flat, and you can then place a large plate or shallow dish on top to steam very large food items. This collapsible steamer is handy to take when traveling or moving, is relatively easy to clean, and can be found quite widely in places like at the local grocery or kitchen ware store. If you decide to get a collapsible steamer, just make sure you purchase one without a center metal rod, such as the one pictured to the right. Why? Because the metal rod in the center will severely restrict the contraption’s steaming capacity. You will only be able to steam food items directly on the steamer itself, and won’t be able to place a plate or bowl on top for steaming larger items or a greater quantity at once. Using a bowl on top of the steamer is sometimes useful if you want to capture any cooking liquid to be used in that dish or in other dishes, and also creates less clean up as you can serve the food directly in the dish itself, without having to clean the collapsible steamer! Cons? Generally limited (due to its size) to steaming one bowlful or one large item at a time, compared to multiple dishes at once. A stainless steel one may be better than a plastic one, as it can withstand a higher temperature. Although more stable than the stand insert (see below), this is not as stable as using the larger multi-tiered steamer pot. This is the simplest set up of the three. It is what it is – a stainless steel stand that you can place inside a pot, and then place a bowl on top to hold the food to be steamed. Benefits? This is very inexpensive and won’t add to your kitchen clutter as it is easy to clean and store. Like the collapsible steamer, you can place a large plate on top in a big pot, and then steam larger foods like squashes or a larger quantity of cut vegetables at once. Cons? You won’t be able to heat any food directly on it, but would need to use a plate or bowl on top each time. It is also at a set height, so you would need to keep this in mind when choosing a simple stand insert. Some are so tall that by the time you place the dish and food item on top you may find you can’t cover the pot with the lid. So consider the size of pots and their depth when picking a steamer stand to take home. It is also not completely stable so you would need to be careful when lifting the hot bowl of steamed food out of the pot to serve. If you don’t have any of the above options and don’t want to purchase one, here is a method to create your own simple steamer contraption. All you need is a large pot with a lid, a heatproof bowl (e.g., Corelle or CorningWare) and a heatproof plate or shallow dish. Then assemble it like so (see picture above) inside a pot. Add about 2-3 inches of water and then place the food to be cooked inside on top of the shallow dish or plate, before covering the pot with its lid. Once the water is boiling inside the pot, you can turn down the stove heat setting when you start steaming the food of choice. Just be careful when removing the steamed food from the pot afterwards, as it will be hot and your homemade contraption won’t be as sturdy as a multi-tiered steamer pot.